“With art therapy, you are trying to get people back into their bodies and feelings by engaging them with materials and in the process of using those materials,” observes board-certified art therapist Joan Stanford, author of the upcoming book The Art of Play: Ignite Your Imagination to Unlock Insight, Healing and Joy. According to Stanford, art therapy helps people stay in the moment. 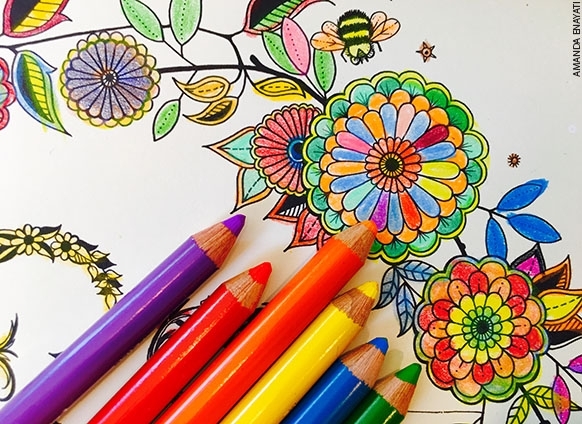 Coloring is therapeutic in a similar way: “You are playing, focused on what you’re doing, lost in the flow.” The concentration and focused attention helps brings those engaged in the activity into the present. “Visualizing and creating, on both conscious and subconscious levels—it’s very powerful,” Stanford says. For those glued to screens for hours every day, coloring can feed the urge to engage in an activity that is perceived as real and concrete, rather than virtual. There is emerging research that putting pen to paper extends benefits that typing and texting do not. Stanford suspects that the act and fluid motions of coloring may also be significant.